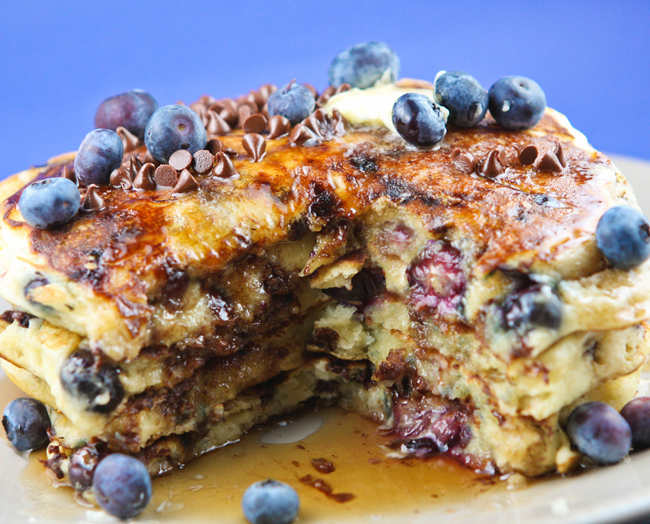 Creating the ultimate stack of pancakes is no easy feat - but adding chocolate chips AND blueberries to the batter is a GREAT start! You will enjoy each morsel of this breakfast treat. They might be your favorite breakfast ever and be made regularly! Whether you add a lot or a little of the toppings, this pancake recipe is perfect, ready to feed some hungry tummies. Did you know that it is Pancake Week? I didn't. I rarely to never make pancakes, and I happened to do so on Pancake Week. How odd! I wanted to make a special breakfast-y meal for Elijah on his birthday, so I figured I couldn't go wrong combining chocolate, blueberries and pancakes. They were super tasty! This recipe made a huge batch, so we have been eating pancakes for breakfast all week. On Pancake Week! Again, odd. Make a batch of pancakes to eat now and freeze some for later! In a medium bowl, combine: 3 cups all-purpose flour, 1/4 cup granulated sugar, 2 teaspoons baking powder, 2 teaspoons baking soda and 1 teaspoon salt. In a large bowl, combine: 3 cups buttermilk, 3 eggs, 1/2 cup butter, melted then add the flour mixture to the batter and stir until just combined. Please do not over-mix! Then add: 1 cup fresh blueberries and 1 cup miniature semi-sweet chocolate chips to the batter. Stir carefully, just until combined. Heat a skillet over medium-low heat and spray it with cooking spray. Use a 3/4-cup measuring cup to scoop the pancake batter onto the hot skillet. The batter will be very thick, so use the back of a spoon to shape each pancake into a circle (or whichever shape you wish). When bubbles begin to form, flip the pancake with a spatula and cook until the batter is no longer runny. I actually had to perform the toothpick test on a few of these due to major fluffiness. The great thing about this recipe is that you can add and subtract filler ingredients to tailor to your liking. Replace the chips and berries with apple slices, bananas or raisins. If you don’t have buttermilk on hand, make your own by combining 1 cup of milk with EITHER 1 tablespoon of lemon juice OR 1 tablespoon of white vinegar. Mix well and let sit for 5-10 minutes, or until small curdles stick to a spoon. In a medium bowl, combine the flour, sugar, baking powder, baking soda and salt. In a large bowl, combine the buttermilk, eggs and butter. Add the flour mixture to the batter and stir until just combined. Do not over mix. 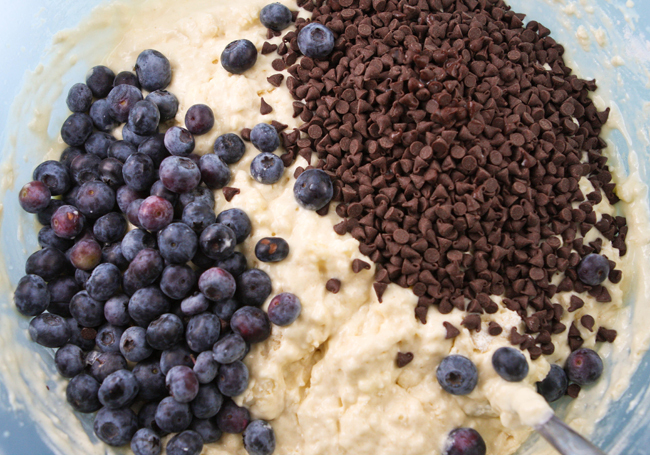 Carefully stir in the blueberries and chocolate chips until just combined. Heat a skillet over medium-low heat and spray with cooking spray. Use a 3/4 measuring cup to scoop the pancake batter onto the hot skillet. 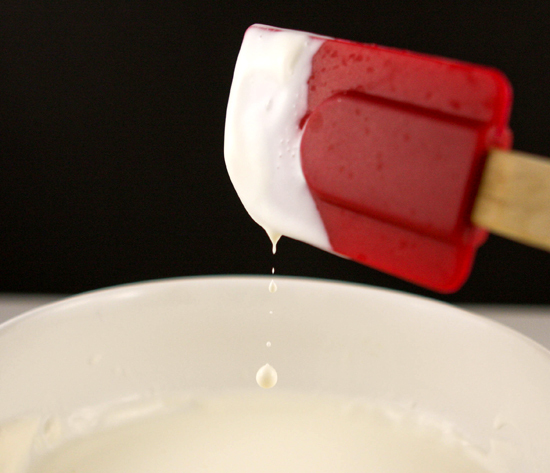 The batter will be thick, so use the back of the spoon to shape into a circle. When bubbles start to form, flip the pancake with a spatula and let the other side cook until cooked all the way through. Serve warm, with butter and syrup.